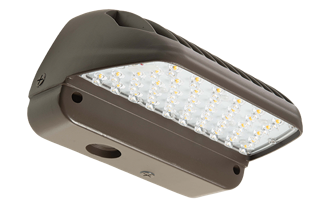 The Aleo WPL2™ Series Large LED Wall Pack Lights Luminaire combines energy-efficiency, advanced optical control, and modern slim profile aesthetics to deliver enhanced performance to outdoor wall-mount lighting applications. Rugged die-cast housing provides advanced thermal management for long life and weather-proof compartment to withstand challenging, outdoor environments. Rugged, die-cast housing with advanced thermal management system ensures reliability and durability.Weather-proof, gasketed driver compartment protects electronics against environmental elements. Precision-formed optical lens system improves safety and security by delivering high-efficiency illumination with precise optical distribution. Type III Med. distribution comes standard. UL Listed. All components have UL certification. DLC QPL. This Large LED Wall Pack Lights Luminaire comes standard mounting plate for quick and easy installation. Suitable for use with sensors to achieve deeper energy-savings. Sensor accessory available: occupancy sensing and photocell. Diffuser Specialist assumes no responsibility for suitability of luminaires and applications.. Subject to changes without notice.